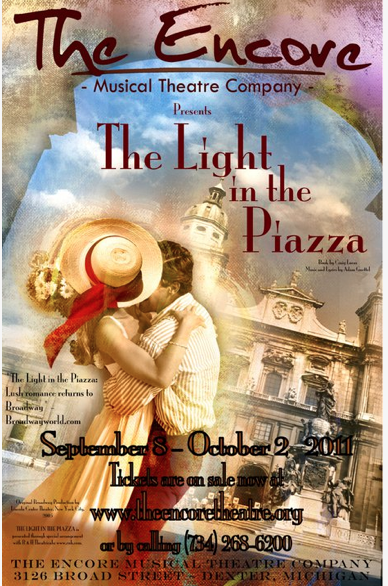 This is going to be a really short and bitter review of University of Michigan School of Music Musical Theatre Program’s “The Light in the Piazza”. In short, the student cast is remarkable, although the show doesn’t work well without actors of the correct ages playing the parts. But without mentioning a single name of the production staff involved, I will simply say that I hated this minimalistic production of the show, and have no idea why someone would direct one of the lushest and most romantic musicals written in the past couple decades in this manner. I will also state that I can not review the entire show because I left about 30 minutes into it, I hated it that much. And I almost never walk out on shows, even stinkers like this one. But I also wasn’t going to waste my time watching this disaster of a production of one of my favorite musicals ever. There is educational theater, which forgives many things. Then there is educational professional theater, which is less forgiving. And this production of The Light in the Piazza short-shrifts the audience at every turn, no matter how well it might be educating its students (of whom, almost none will appear in a production such as this in the future, so I am not sure its helping them a whole lot either). Not recommended. Listen to the cast album, or find a bootleg of the Broadway production when it was broadcast on PBS.